House with pool in Tuscany garden. 5 bedrooms, 4 bathrooms . Sleeps 10-12. It is impossible not to fall in love with the garden at Casa San Mario; the big chestnut tree offering shade on a hot summer’s day, the terracotta patio where hours can be spent enjoying a lazy lunch or dinner, the generous pool where you can cool off after a morning spent exploring Volterra, or, as in the case of my daughters, topping up a tan. Younger children can enjoy making dens in the garden or exploring the shaded woods, and when the sun sets the whole family can take part in hotly contested ping-pong tournaments on our floodlit ping-pong terrace. For a unique experience, the garden boasts a truly Italian pizza oven, where we enjoy making pizza and bread. The house is a large, classical Tuscan farmhouse. Because of its traditional building style and airy rooms the house stays pleasantly cool, even in mid-august. It is ideal for both adults and families, and has 5 bedrooms and 4 bathrooms, as well as a separate toilet in the utility room. There is a living room upstairs, equipped with a large fireplace, where in the cooler seasons it is pleasant to play cards and chat, and two smaller sitting room/studies downstairs. Our favourite room in the house is the very large farmhouse kitchen and dining room downstairs, this room has a 14 seat hardwood table, and once the sun has gone down it and the adjoining terrace are often the hub of the house. Volterra (4km from the house) is a very attractive, small hilltop town. The road from the house offers breath-taking views of Tuscany. Volterra was founded in pre-Etruscan time and flourished in the Etruscan period. It became important again in the Renaissance. Our house happens to be on the Roman unmarked road that leads to Florence. There is an impressive Etruscan Museum and a small, very pleasant, Art Gallery. Walking in Volterra is always a pleasure thanks to the medieval architecture (fans of Twilight may recognise the piazza! ), and there are plenty of interesting shops selling Italian leather, shoes, and clothing. There are also small grocery shops selling local produce, as well as a fantastic farmers’ market on Saturdays. If you are tired you can take a break at one of Volterra’s many cafes (we recommend l’Incontro, where you can have a proper Italian cappuccino, homemade ice-cream or pasticcini, and after dark enjoy wine tasting or sample their delicious cocktails). 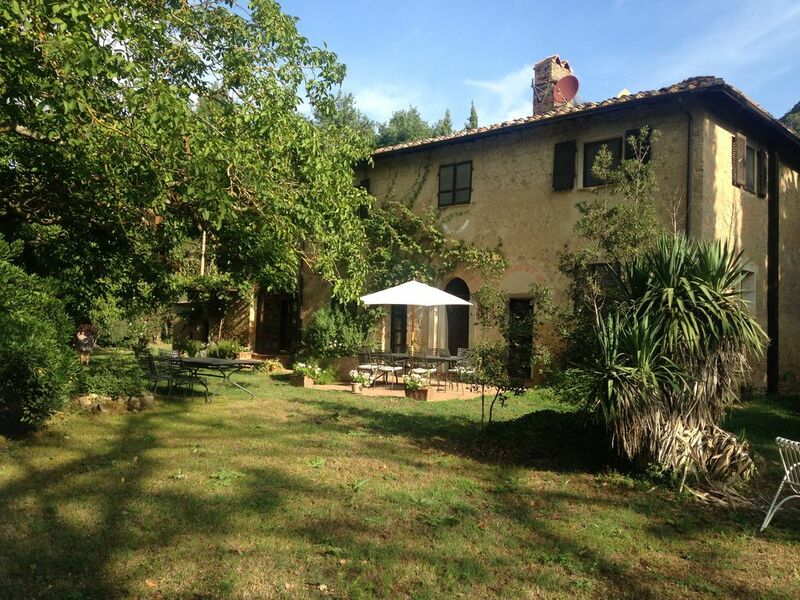 The house is also close to Pisa, Florence, Siena and San Gimignano, as well as many interesting vineyards and farms. Why not explore Dante’s birthplace, or visit Fattoria Lischeto – supplier to Harrods – for a traditional Tuscan lunch, followed by a cheese-making class? And after a hard day sight-seeing, return to the beauty and tranquillity of Casa San Mario. The house can accommodate up to 12 persons in comfort. Upstairs, on the first floor, there are three bedrooms with bathroom en suite and a large sitting room. Downstairs there are a large kitchen-dining room, a small kitchen and a living room, and two bedroom with one bathroom, and a utility room. Please see the house plan in the Photos section. Swimming pool (Open May to mid October) seventy-five metres from the house. Green mosaic tiles. Width: 5m. Length: 13m. Depth from 1.4 to 2.6m. Surrounded by solarium of local stone and sandstone rocks and by the side of a small Oak wood providing shade. Garden: Mature shaded garden and trees around the house, further away newly planted fruit orchard and open fields. Garden and pool furniture. Barbecue, washing line, parking, table tennis table and bats, traditional bread and pizza oven. Central Heating, available in the Autumn and winter. Wood oven, located in the garden. Suitable for making bread, pizza, and also I believe, for roasting. Open and included in the rental from early May to mid- October - at other times it may be available on request. Amazing! We were 3 families coming from different parts of Asia and Europe, 6 adults and 6 kids. The house is perfectly located to easily reach Volterra (incredible history, restaurants, museums), San Gimignano, Sienna, Florence. The house is spacious, has everything you need including a beautiful kitchen, outdoor space, BBQ, sports (the view from the pool is incredible), games, etc. Very clean, plenty of parking,very secure and fun hiking just outside the gate. The photos honestly don't do it justice as it is a perfect mix of everything you need (including towels and linens, complete kitchen, etc ) and no clutter. Sonia, the caretaker is also great, very helpful (she advised a fantastic Agroturismo pizza place just 10 min away with beautiful sunset views of the Tuscan hillside). Water, Wifi, Pool, all great and worked perfectly. The kids were super happy, parents super happy, everything was so easy- a perfect vacation home rental! We had many nights of playing Risk and other games at the house. Great wine and Agroturismo locations nearby. We are avid world travelers with kids and have stayed at many places in many countries and we are all excited to return next year. Pluses include self laundry on site, baby items (cot, high chair, puree), table tennis, badminton, outdoor pizza oven, good food markets within 10 minutes, secluded, safe, outdoors activities and so much more. Highly recommended. Thank you Katherine for your review: we are really happy that you and your family have enjoyed the house. We hope to see you again! A delightful property in a wonderful location! The facilities were as described and provided all that we expected and more! We made use of the pizza oven and bar b q, and obviously the swimming pool which was kept immaculate throughout the week, as was the whole property on our arrival. Altogether an exceptional holiday worth every euro ! Good family get together in beautiful Italy. Batteries recharged. Wonderful setting. No hitches or glitches from booking to leaving property. Wonderful family holiday in peace and quiet with spectacular views of Tuscan countryside. Volterra has not been taken over by mass tourism and still retains it's identity. Family of 11 stayed here for one week and it was fabulous. The home was perfect for us -plenty of room. The pool and the view were absolutely spectacular! We cooked every meal in the kitchen with ingredients from the local markets and grocery stores. You will not be disappointed if you rent this place! The property is gorgeous from the exterior, huge garden, table tennis, bbq area with two bbq's (no pizza oven), lovely large pool (freezing cold in june but probably warmer later in the season) and quite rustic and dark in the interior (small windows/ dark wood). There is plenty of space and two fridges was great for 9 of us staying there. Nice to have separate beds (we are all work colleagues) and enough bathrooms for all! There are enough pots and pans and lots of utensils and good sharp knives which were all nice to have in a rental property. The only thing I would mention is that the oven takes ages to cook anything - in never seems to get up to heat so roasted veg one evening took 2 hours etc - basically double the time you think it will take to cook things in the oven. However this doesnt impact your stay with a little planning! The housekeeper Sonia is very good if you speak a little Italian (take a phrase book if not!) - our kettle broke and she replaced it that same day - very efficient. There is no phone reception at the house (sometimes you can get it in the garden) but you can call her on the house phone. The internet is not fast but it is fine for a bit of internet searching and emailing and the odd skype call (it struggled with Viber calls though) - it went down once during our stay but I mentioned it to sonias husband and it was fixed same day. We had thunderstorms an an earthquake whilst at the house (v Exciting!) and the electricity went off but we just followed the instructions in the house information and got it all working easily. A few other things to mention - bring mosquito repellent - they are out day and night especially by the pool. We had a small infestation of woodlice in one of the downstairs bedrooms (mentioned to sonia on departure) and a flood in the same bedroom from rain pouring in through the closed and locked patio doors. It did not detract from our holiday and was mentioned so the housekeeper can do something about it for next guests. Overall we had a lovely time at the house and whilst there are a few things that need fixing I think the house is well priced for what you get and the area is just beautiful - we walked up Monte Voltraio behind the house and also along the dirt road to palagione and back, Volterra tour is worth doing too. We went to Florence for the day and also went to San Gimignano for dinner which was lovely. So much to do in the area. This was our second family holiday to Casa San Mario and everyone enjoyed the holiday just as much as on our first visit. Our party consisted of six adults and three young children and the house suited our needs very well. There are five bedrooms with four bathrooms which meant everyone had their own facilities and space. The house is well maintained although not pristine. We also liked the lovely gardens and that the excellent swimming pool is away from the house. There are lovely countryside views particularly from the pool end of the garden. The house is situated along a small unmade road and has no immediate neighbours. It is in a very pretty and tranquil spot. Volterra and its supermarkets are easily reachable by car. Altogether the house represents excellent value for money and is highly recommended. I am sure our family will all want to return for another Tuscan holiday. Thank you Geoff for your lovely review. We are really pleased when our guests enjoy their stay at the house. Swimming Pool Open around May 1; closed around September 30th. Rental price within this period includes swimming pool maintenance. Swimming can be opened at other times on payment of additional fee. Please enquire for last-minute rental' offers. Special rates are available for lets of four weeks or more in the November - April period.